Get ready for the 3 Days Mega SALE up to 70% on selected items! 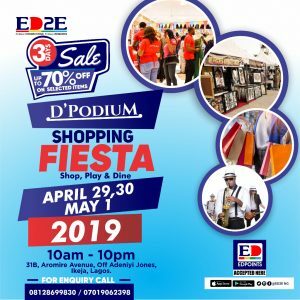 Come and join our Shopping Fiesta this coming April 29,30 and May 1, 2019 from 10am to 10pm daily at D’Podium International Event Centre! Live band,different performances,comedy and lots of entertainment awaits you!! !